What are the Worst Gym Machines? SSOR has a very active population that goes across the lifespan. We have a goal-oriented population that demands results quickly. They want to get back to their activities as quickly as possible. Inevitably, the topic of working out comes up and they ask “What machines should I avoid (or do) at the gym?” Well, an article in Men’s Journal explored this very topic. Not a bad list, but we have a few comments. We do agree that machines are great for beginners because they’re more controlled and safer and they’re good for bodybuilders, but we have a few other comments on what is proposed as the worst gym machines. We agree – for the most part. Yes, step ups, lunges, squats and other exercises like that give you more “bang for your buck.” Agreed, seated knee extensions can be brutal on older, degenerative knees. If you hear the “rice krispies” in your knee when you straighten it, this machine really isn’t for you. Plus, if you have anterior knee pain or tendonitis, this isn’t your best choice. However, if you have a surgery to the foot, ankle, or lower leg, this machine can be good to keep your quadriceps muscles from atrophying too much until you can do weight-bearing activities. We don’t really agree with this one. That said, we’re OK with the reasoning as a potential reason why you would not use it. 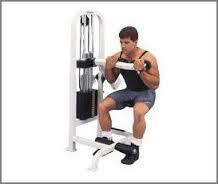 Not all leg presses are the same though either. Some you can lay on your back and it’s not the adverse position the author is talking about. Furthermore, it’s easier for people to push some weight without having to do sometimes intimidating free-weight squats with a barbell or similar movements. We love the leg press for our elderly folks that have had a knee replacement to help work their quadriceps muscles. Plus, if you have any loading restrictions, you can lie on your back and push weight that is even less than bodyweight. We definitely wouldn’t pick on leg press as much. Agree. This machine is tough on your back. Much better to do trunk twists doing medicine ball throws or with a cable machine. Basically agree. The other exercises he proposed are indeed a little better for those muscle groups. 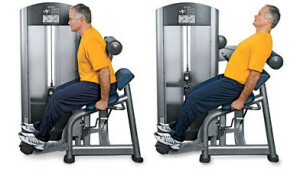 Again though, this machine is a good choice for people who can’t do those ones in standing either due to age or pathology or if there are safety concerns. Two that should have been on this list is the seated crunch machine and the seated back extension machine, pictured below. The risk/reward for using those just isn’t there and they are far worse choices than the leg press or the hip abduction/adduction machine. Both of those machines are really tough on your discs in the spine. Get injured at the gym or have questions about what exercises are best for you? Give us a call. It would be a privilege to serve you and partner with you in your care. Remember, you can see a PT in Kansas without a physician referral.